This strain was a pleasure to work with from start to finish. She displayed vigorous growth in veg, and responded very well to multiple topping sessions. All tops transformed into dominant colas after about 10 days of stretch when switched to flower. She took all the veg nutes I could throw at her, following the REMO nutrient regiment. Flowering set in quickly and top bud sites were clearly visible by the end of week 1. Trichromes started to develop by the middle of week 3. I harvested at day 56 and am overly pleased with the end result. Sticky frost covered buds that jam up my hand grinder. A very heavy stone that leaves you wanting a weed nap about 2 hours later. I would recommend this strain if you are trying to be productive. I would DEFINITELY recommend this strain if you want your pain to melt away after a few puffs. Excellent for use as a sleep aid. Tastes of subtle Grape fruit with some spice. Smells similar, with the fruity notes really coming through with curling. Thick lung fulls of smoke on the exhale. Very satisfying. Want Some Strawberries !! 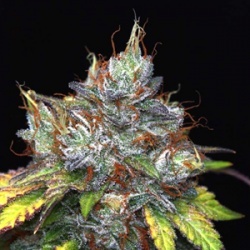 Strawberry Blue is Pure Strawberry stabilized with male hybrid New Blue Line then hit with a White Fire and a White Pheno Snowlotus to make a very fruity strawberry type of strain. A nice mix of colours on the buds that will amaze you with resin. If you want a di$erent looking strain ,Well here it is. Classic Afghani at its finest, with a twist! Another easy grower, that will keep you guessing. She vegged exceptionally well, and loved being topped multiple times. Stretch lasted just under two weeks. Flowering set in quick fast with this strain, not noticing dominant top bud sites until around the end of week 2. Trichromes production did not start to take off until around week 3, but when it did, it went crazy. Buds looked to be growing quite slowly until week 5 then BAM..it was like they woke up from a long nap and didn't slow down until harvest at 56 days. I could have waited another week for extra bud size, but not necessary. Smells very sweet, with a few other floral notes. Taste sweet, with a bit of spicey. Smooth on the lungs. I would HIGHLY recommend this strain as for daytime use. Probably not the best choice for before bed. This strain is a unique orange and yellow looking resin tint to it. You will wonder how she is white then turns out different colours later till she matures, A very good hardy Strain against mold and Stress and that will have high medical value and smells like citrus fire then some skunky mint . She will be a great easy plant to grow and very fast vegging , she gets Big, make sure to have supports for those buds.